Most errors and inefficiencies in patient care arise not from the solitary actions of individuals but from conflicting, incomplete, or sub-optimal systems of which they are a part and with which they interact. To improve the design of these systems, the US Institute of Medicine (IOM) has proposed the application of engineering concepts and methods—in particular, human factors and systems engineering. 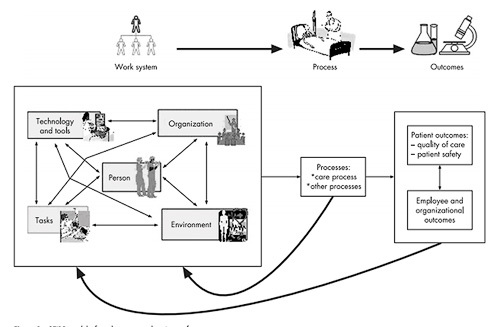 This paper highlights the Systems Engineering Initiative for Patient Safety (SEIPS) originally funded by the Agency for Healthcare Research and Quality, meets this challenge through a novel integration of human factors and healthcare quality models. In order to view the SEIPS model please click here.